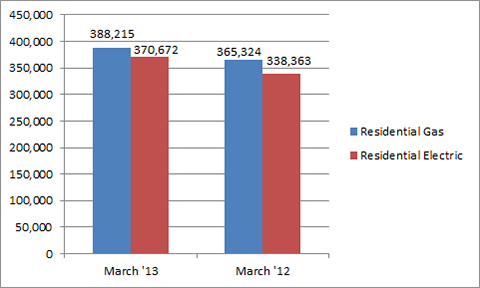 U.S. shipments of residential gas storage water heaters for March 2013 increased 6.3 percent, to 388,215 units, up from 365,324 units shipped in March 2012. 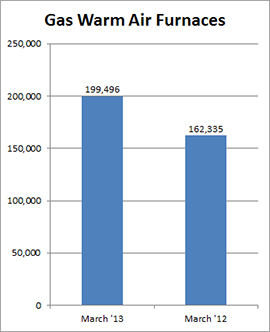 Residential electric storage water heater shipments increased 9.5 percent in March 2013, to 370,672 units, up from 338,363 units shipped in March 2012. For the year-to-date, U.S. shipments of residential gas storage water heaters increased 8.3 percent, to 1,097,072, compared to 1,012,962 units shipped during the same period in 2012. Residential electric storage water heater shipments increased 5.8 percent year-to-date, to 1,025,748 units, compared to 969,932 units shipped during the same period in 2012. 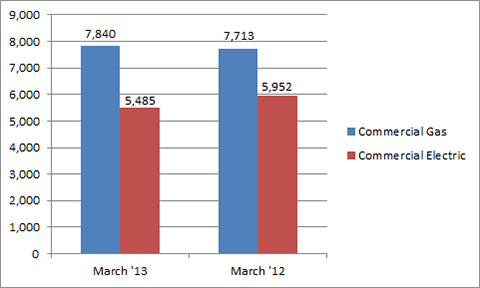 Commercial gas storage water heater shipments increased 1.6 percent in March 2013, to 7,840 units, up from 7,713 units shipped in March 2012. Commercial electric storage water heater shipments decreased 7.8 percent in March 2013, to 5,485 units, down from 5,952 units shipped in March 2012. Year-to-date U.S. shipments of commercial gas storage water heaters increased 18.9 percent, to 24,508 units, compared with 20,610 units shipped during the same period in 2012. Year-to-date commercial electric storage water heater shipments increased 2.8 percent to 16,151 units, up from 15,707 units shipped during the same period in 2012. 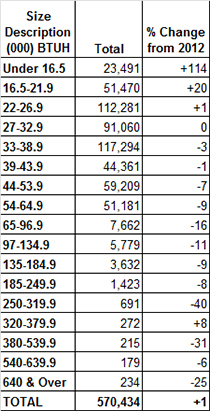 U.S. shipments of gas warm air furnaces for March 2013 increased 22.9 percent, to 199,496 units, up from 162,335 units shipped in March 2012. 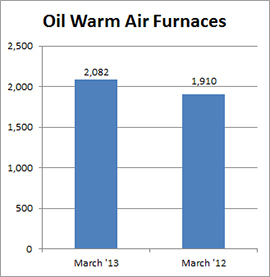 Oil warm air furnace shipments increased 9 percent, to 2,082 units in March 2013, up from 1,910 units shipped in March 2012. Year-to-date U.S. shipments of gas warm air furnaces increased 24.7 percent, to 541,735 units, compared with 434,354 units shipped during the same period in 2012. Year-to-date U.S. shipments of oil warm air furnaces decreased 8.1 percent to 7,137, compared with 7,765 units shipped during the same period in 2012. U.S. shipments of central air conditioners and air-source heat pumps totaled 570,434 units in March 2013, up .6 percent from 567,247 units shipped in March 2012. 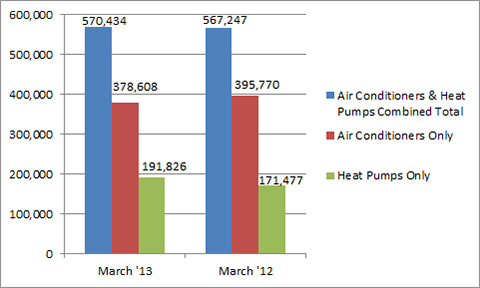 U.S. shipments of air conditioners decreased 4.3 percent, to 378,608 units, down from 395,770 units shipped in March 2012. U.S. shipments of air-source heat pumps increased 11.9 percent, to 191,826 units, up from 171,477 units shipped in March 2012. Year-to-date combined shipments of central air conditioners and air-source heat pumps increased 9.8 percent, to 1,229,247 units, up from 1,119,944 units shipped in March 2012. Year-to-date shipments of central air conditioners increased 6.9 percent, to 789,588 units, up from 738,740 units shipped during the same period in 2012. The year-to-date total for heat pump shipments increased 15.3 percent, to 439,659 units, up from 381,204 units shipped during the same period in 2012.